I recently had the joy of visiting Barcelona for a week. My husband was attending a conference while I spent my days touring around, but I knew there was one place I wanted to go before I left: Tetereria Tea House. I found out about this tea house when I was looking up whether I could reasonably expect to find a decent cup of tea while I was there, or if I should consider bringing my own (it turned out that the coffee shop around the corner from our hotel had a lovely assortment of loose leaf teas, plus almost everywhere served tea in pyramid tea bags, so I needn’t have worried!). I discovered that Barcelona is home to a tea house where you can not only get a decent cup of tea, but you can get a tea session with traditional teaware and a surprising variety of teas. Sadly, Tetereria is only open from 5-9:30 p.m. Wednesday through Sunday, so I had a limited window in which to visit (if I’d looked up the hours sooner, I might have tried to stop by the first night we were in town, jet lag be damned!). But I knew it was something I wanted to make sure to experience, so I convinced my husband that we could visit the tea house on a Wednesday afternoon before his conference’s gala dinner that evening. Tetereria is located a short walk from the Lesseps subway stop, which is on Line 3 (the green line). This made it very convenient from our hotel near the Placa d’Espanya! I imagine it would also be relatively convenient from the Gothic Quarter as well. The walk brings you down some typically narrow European streets, around a corner, and through the narrow shop entrance into a veritable oasis of tea. It’s cozy and has a warm feeling to the decor, with an eclectic mix of styles. About halfway back, there is a small counter where you can order tea to go, mostly latte-style drinks like chai lattes and matcha lattes, and then there are several small tables around the tea house. My husband and I sat towards the back of the shop and were able to see the partitioned area at the back, which is set up like a traditional Japanese tatami room for the Japanese tea ceremony. Upon sitting down, we were greeted by one of the owners, and given menus. There was a book of available teas, sorted by type (pu-erh, black, oolong, green, white, herbal, etc. ), and listed with a flavor profile diagram that gave the relative qualities of different flavors in the tea such as floral, astringent, body, etc. I decided to try a hei cha, which I had never tried before, and my husband went for a traditionally-prepared bowl of Kyoto matcha. We also got some sweets to go with the tea: I had a thin slice of apple cake and he had a rather large matcha-flavored dorayaki. Upon making our selections (and it took much longer than outlined above — I oscillated among an oolong, a shou pu-erh, or a hei cha for a while), we were faced with what was probably the biggest obstacle we faced: I understand the intricacies of the teas we wished to order, while my husband is the one who speaks Spanish. This was made particularly apparent when they turned out to be out of the matcha that my husband initially chose (i.e., that I chose for him), and he had to decide on the fly which matcha the lady suggested he would like to substitute. I believe he chose the Kyoto because he’d heard of Kyoto (similarly to how my father used to order Merlot because it was the only wine he could confidently pronounce). I was then able to order my hei cha mostly in Spanish (and Chinese, I suppose), along with my apple cake. Luckily, I’d spent the last three days learning the words for foods that I liked to eat! After we ordered, the tea arrived fairly quickly. Each tea is brought out individually with a cart that holds all the necessary teaware. 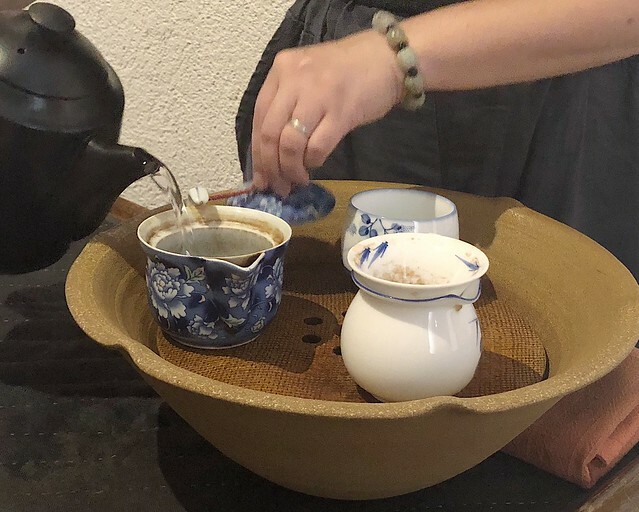 So first, she brought out mine, with a gongfu brewing set, the pot of hot water, and a small dish of the single serving of tea (I was able to watch her weigh it out off the larger brick of tea while she prepared the cart). She gave me the leaves to inspect, and I noted that they didn’t have either the strong earthy quality of dried shou pu-erh, nor the green nature that I associate with sheng, but instead were a unique experience. Which was exactly what I had been hoping! She then went through the rinse of the leaves and two steepings. One steeping she poured from the sharing pitcher into the single cup, and the other she left in the pitcher. The entire set was placed before me to consider while I enjoyed my tea. She then re-prepared the cart to bring my husband his matcha, gathering a matcha bowl, whisk, scoop, and a dish of beautifully green matcha powder. I was particularly impressed with her whisking technique and the voluminous amount of froth she was able to generate in a short time. Unfortunately, my husband finished his matcha fairly quickly, so I got very few photos of it, but I did get a taste, and it was a lovely, balanced matcha with a mild umami flavor that melted almost instantly into sweetness, plus a vegetal floral nature that I found very pleasant. He liked it, too. My tea started out with a lighter body and subtle earthiness, as compressed teas sometimes do, but after the second or third steeping, started opening up into something with a lovely sweetness and depth. There was almost a smokiness at one point. After my initial two steepings, the lady in the shop came around every so often with the pot of hot water so I could keep steeping, which was nice. At one point, she noticed that I was sharing with my husband and let me know I could turn down the water at any point, but I (stiltedly) explained that I thought he would like it, too. I was intrigued by the almost coffee-like qualities I noticed as the session went on, which is part of why I started sharing with him. We share tasting notes when he gets single-origin coffee at our favorite coffee house, so I thought this would be a nice way to reverse that, given that he’s not often present for my tea sessions. Sometime in this whirl of amazing tea, our food came. The apple cake was delicious, not too sweet, and the perfect amount to serve as a late afternoon snack before a late dinner. My husband was hungrier, which was good because he received a jellied sweet along with his matcha, as well as the dorayaki he ordered. All in all, it was a lovely visit, taking just over an hour. We probably could have spent longer, but we did need to make our way to the gala dinner for my husband’s conference. But I didn’t feel rushed or cheated. I did, however, leave with a desire to return not only to Barcelona, but also to Tetereria. Fortunately, we have some lovely teterias teahouses in Barcelona. Not only this one. Everyone special and people who know and love the world of tea and its culture. I would have loved to have visited more of them! I was only in Barcelona for a week and I sincerely hope to return some day. I found the people more welcoming than any other European city I’ve ever visited.